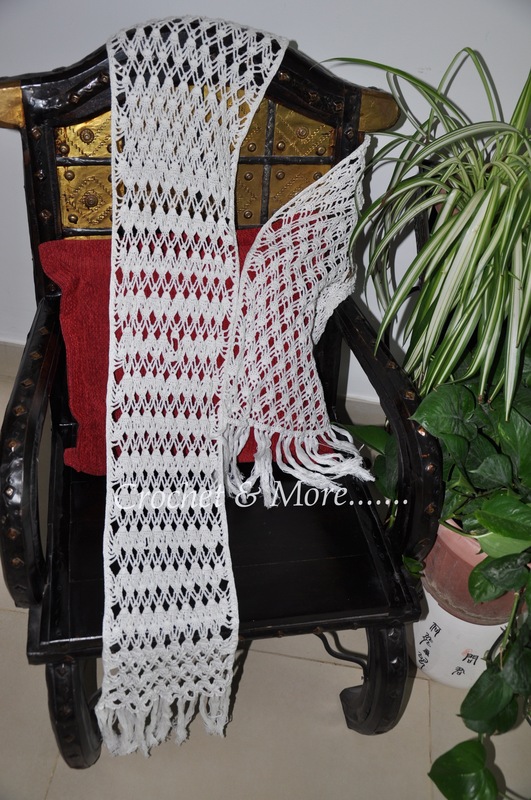 Crocheted another scarf for my sis, who decided that after the black one….she wanted one in white….and a crochet pal of mine Rajeswari S Sekar shared this pattern, just then. Didn’t think much of it initially but then, it started showing possibilities…especially since I was to fly to Kochi soon and the only hook that I could take on board was a bamboo 2.00mm hook. And I just happened to have a cone of cotton yarn…Chinese ( not easy to hook with and not as good quality as the Indian cotton cone…but suited this project). 2. sc in 3rd chain from hook; 3 ch, sk 3 chs; dc in next chain, 2ch, dc in same chain as the first dc( creating a ‘V’ stitch); 3 ch, sk 3 chs; scs in next 3 chains; 3 chs, sk 3 chs,; scs in next 2 chs. 3. 6 ch up; 5 dcs into 2 ch loop; 4 ch; sc in the 2nd sc of the 3 secs in the first row; 4 ch; 5 dcs in 2 ch loop; 4 chain; sc in last chain of first row. 4. 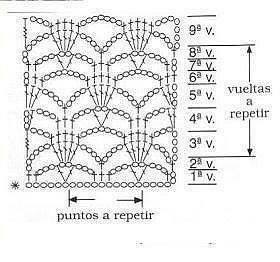 6 ch up; 5 sc in each dc of 2nd row; 5 sc in ech of the dcs of previous row; 3 chs; tr crochet in 5th chain of previous row. 5. 3 ch up, dc in treble of previous row; 3 ch; sc into next 5 dcs; 7 ch; scs in each of the next 5 dcs; 3 chs; 1 tr in 5th chain of previous row. 6. 3 ch up 1 dc into the tr of previous row; 3 ch; sk first sc; secs into next 3 scs; sk next sc; 3ch; dc into 4th ch, 2 ch, dc in 4th chain( creating another ‘V’); 3 ch;sk first sc; secs into next 3 scs; sk next sc; 3 ch; 2 dc into 4th chain of previous row. 7. 3 ch up; 2 dc into first dc of previous row; 4 ch; sk first sc; sc into next sc; sk next sc; 4 ch; 5 dcs into 2 ch loop; 4 ch; sk first sc; sc in next sc; sk next sc; 4 ch; 3 dc into first ch of first 3 ch up. 8. 2 ch up, sc in next 2 dc; 7 ch sc in next 5 dcs; 7 ch; 3 scs in next 3 stitches. Repeat from Row 2 to Row 8, until yo get required length.